Together, these findings show that many younger adults are experiencing “downward mobility.” In other words, they are not doing as well, either socially or economically, as their parents were at the same age. Will things always get better? The idea of downward mobility is especially troubling for Americans, writes Robert Samuelson in The Washington Post. He says most U.S. citizens believe that, over time, the amount of money they earn will rise and life will get easier. And for some, that belief has come true. In the “Fading American Dream” study, researchers found that 90 percent of Americans born in the 1940s grew up to earn more than their parents. That percentage is so high, say the researchers, partly because of historical events. 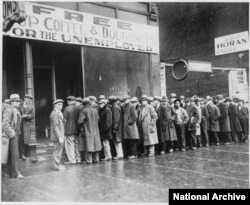 In the 1930s, the U.S. economy was in a severe depression, and most people’s earnings went down. But in the 1950s, the economy expanded, and most people’s incomes went up. As a result, almost all Americans born in the 1940s experienced upward mobility. But among members of this generation, only about 60 percent of their children earned more money than they did. And only 50 percent of children born in the following 10 years were earning more than their parents at the same age. In other words, Americans’ ease of living is going down. In technical terms, the economists write, “Absolute mobility has fallen sharply” over the past 50 years. Alissa Quart wrote a book about the financial difficulties of everyday Americans. It is called Squeezed: Why Our Families Can’t Afford America. In her book, Quart tells about teachers who are struggling to pay for housing, child care and other regular costs. One high school teacher said he drives for ride sharing service Uber at night to earn more money. He corrects students’ papers between riders. Another man, a college professor, only earns enough to pay for simple food, such as pasta and potatoes, for his children. A different college professor turned to government assistance to feed her child and pay for a doctor. Quart says even lawyers increasingly cannot earn an income that enables them to meet their needs. The problem of decreasing incomes in their field is made worse by debt they may have from law school. In this Thursday, June 21, 2018 photo, a job applicant looks at job listings for the Riverside Hotel at a job fair hosted by Job News South Florida, in Sunrise, Fla.
Quart and the economists who studied these issues say many things have led to lower incomes and downward mobility. 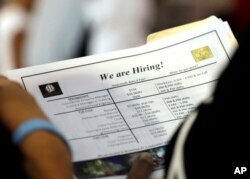 The economic recession of 2007 to 2009 is partly to blame, they say. Modern technology also plays a part. Quart says robots threaten to reduce the earnings of health care workers, truckers, reporters, and people who work at supermarkets, drug stores and tax preparation services. In The Washington Post, Robert Samuelson noted that poor schools, a weak housing industry and too many government rules also are to blame. With all these things – and more – partly responsible, what is the solution? These experts say the answer is complex. But all point to one issue that needs to be examined: economic inequality. Quartz writes that while America is one of the richest countries in the world, it also has one of the biggest divides between the wealthy and the poor. 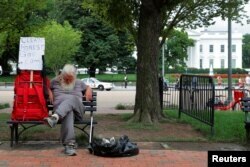 A homeless man sits outside the White House in Washington, U.S., August 2, 2018. 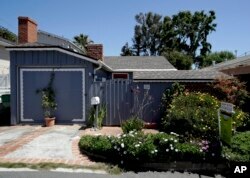 The researchers in the “Fading American Dream” study make a similar observation. They say raising GDP -- the gross domestic product – will not significantly improve the economic situation of most Americans. A higher GDP may help only those who are already doing well. Instead, the economists say, the United States could try to repeat something Americans born in the 1940s experienced. As those children grew up, they almost all benefited from a better economy. Kelly Jean Kelly reported this story for VOA Learning English. Her story was based on material from VOANews.com, The New York Post, The Washington Post, the Brookings Institution, and the Credit Suisse Global Wealth Report. George Grow was the editor.